Choral Music at Gunn High School is a thriving department directed by William Liberatore. Inspired by a sincere love of music and commitment to excellence, the Gunn High School Concert Choir, Treble Choir, and Chamber Singers perform a wide variety of choral literature including Renaissance, Baroque, Classical, Jazz, Gospel, and music from countries around the world. 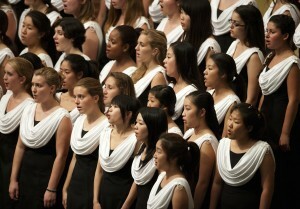 Since 1991, the Gunn Choir has received 18 Unanimous Superior ratings from the California Music Educators Association. The choir also been awarded First Prize at the National Events Festival in Vancouver, the Heritage Festival in Anaheim, and the Command Performance Festival in San Diego. Members of the choir have performed in and been recognized for outstanding performances in the All-State and Regional Honor Choirs and various festivals throughout the state. The choir traveled to the South of France and Spain in 2013, performing in the Eglise Saint-Pierre in Avignon, Nuestra Señora de los Angeles in Barcelona, and the Basilica de Santa María in Manresa, among other sites. In 2011 the choir performed at the Sant’Agnese Cathedral in Rome and several other historic cathedrals in Rome and Florence, and sang High Mass in Saint Peter’s Basilica at the Vatican. The choir traveled to Austria and the Czech Republic in 2009, singing in the Spanish Synagogue in Prague and a number of historic cathedrals, culminating in a combined choral performance with orchestra in the Votiv Kirche in Vienna conducted by Dr. Hilary Apfelstadt and Dr. Anna Hamre. Other recent trips have featured destinations including London, Florence, Vancouver, Los Angeles, Australia, New York City, a cruise to Mexico, and an earlier performance at the Vatican in 2006. Local activities include participating in the prestigious Stanford Invitational Choral Festival in 2007, winning the KFOX School of Rock Award in 2008, and Unanimous Superior ratings at the CMEA meeting in 2009.